New Hillcrest Hotel is a small, high standard establishment located in the Westlands area, which is a serene and quiet locality. New Hillcrest hotel first opened its doors in 1972 and has continuously worked at modernising its facilities while maintaining the comfort it has always been known to offer. The hotel is ten minutes drive from the city centre on Waiyaki Way and is about 20km from Jomo Kenyatta International Airport. Located with proximity to various recreational facilities such as Casinos, Clubs, and Cinema theatre. 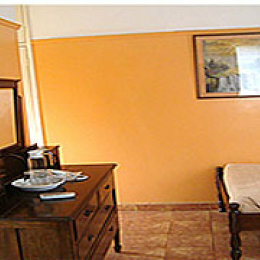 While having tourist attraction sites such as the Nairobi Museum, Nairobi National Park, Animal Orphanage and Karen Blixen Museum among others situated short distances from the hotel. There are also shopping malls and banks at walking distance from the hotel. Hillcrest Hotel has 26 rooms; spacious, clean, comfortable and are equipped with Television, mosquito nets, telephone extensions and private bathrooms with hot showers. Enjoy dining at our restaurant with plenty meal options available. The restaurant offers a unique selection of food and drink with a wide variety of various cuisines. The hotel's professional staff treats guests with warm smile and overwhelming hospitality. They make sure that the services provided by are the best, and they will suit your needs and desires.